Its the third year we have visited this attraction and it continues to not disappoint. they did change a few things up this year, but the atmosphere is incredible. Since we went on a Saturday late in the season, we purchased VIP for this event. Good thing we did because the line was extremely long. However, VIP was very short and given a night like tonight, its amazing more people don’t purchase VIP. Walking through the old campus is creepy enough, and that’s before you even get in the attractions. Since it was extremely crowded, we had to park in a different area that was not as creepy to walk up to the ticket as the other parking lot. This haunt will continue to be a must visit every year. I have always wanted to go to this attraction. This year I made an effort to do it. Once f the detracting factors in the past was the fact that you had to schedule a time to go. Now I see why they do this. It helps with controlling the crowds and limiting wait times to 30 minutes. Another interesting thing was the parking. parking is located at teh Philadelphia Zoo and you take the “Ghost Bus” to the attraction. It drops you off at one end of the prison and picks you up at the other end. We purchased VIP for this attraction, but to be honest, its not really necessary. After you visit the first attraction and wait 30 minutes, the rest have very short lines and VIP is not even offered at them. 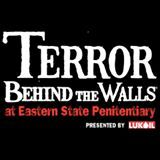 However, Terror Behind the Walls does deliver an experience that is worth revisiting year after year. Since the Hurricane derailed our initial plans, we followed up the visit the following week. The place was packed. We didn’t park in the usual place. They were parking cars wherever they could. Lines were extremely long and thankfully we purchased VIP tickets. Its amazing on a busy night like this that more people don’t purchase VIP, especially on a rare chilly night. To control the crowds, some attractions implemented a chute system. Where they placed people into a group, and when the green light for the chute was lit, they would enter the attraction. It was a good way to help get the lines moving and get people staged to enter the attraction. All said, the place is still amazing. This is the first time we have been here and my expectations were low since they don’t seem to do a lot of advertising. This is located behind the Columbus Farmers Market and I actually passed the entrance the first time since it was really hard to see the sign. Once we parked and walked 2 blocks to the entrance, I must say I was really impressed. Although you can see where the budget is not that large, they do a fantastic job with the scenery and setup. Even the actors were very interactive. It was actually very well done and it was a gem to visit. This is the first year ii did not go on opening night. So I was expecting a large crowd and planned on purchasing VIP tonight. 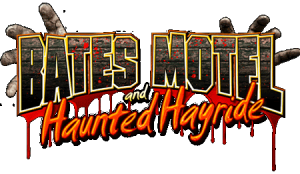 I was quite surprised that they had a VIP combo ticket that include the Haunted Paintball Hayride. I always have fun coming to this place and this year was no different. Although they don’t have much else beside the attractions, it always has been on my must do list year after year. We have always enjoyed our visit to Frightland whenever we have gone. This year we decided to try it out on its opening weekend. Unfortunately, we picked a really bad night. It started to rain when we got their and half of the attractions were shutdown. On top of that, they did not have their carnival rides out. Although, with the rain, they probably would have been shut down as well. However, I really can’t be too harsh in reviewing the place as the rain was out of their control. I will review the attractions we attended, but also place emphasis on our experience from the past. Its been 3 years since I went to the Bates Motel. The last time I went I thought it was pretty good. Given it was the beginning of the season, their second weekend, and with the inclement weather, my expectations were pretty low. I was pleasantly surprised with the experience I had. There were no crowds, the attractions were amazing, the actors were excellent, and it was a lot of fun. You can definitely tell that the same people who run Pennhurst Asylum also run this place as well. This will now be placed on the “must visit” list year after year. My visit to Night of Terror has been changed from 9/24/2016 to 10/7/2016. Look forward to seeing you there !! !